4 participants max, lodging included! 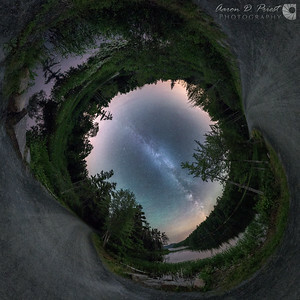 Capture the full spectacle of the heavens by learning how to shoot panoramas of the night sky. Learn everything from the basics to the complex of night sky panoramic photography in this post-processing intense 4-day workshop along Maine's beautiful Bold Coast. If you have never tried a panorama, have tried but had problematic results, or want to learn how to perfect the technique this is the workshop for you. Please bring whatever panorama gear you have and if you want to try out panos for the first time we have a Nodal Ninja 6 and two Really Right Stuff multi-row panning heads to experiment with. Post processing will be a major focus of this workshop and you will need to bring a laptop with Photoshop or Lightroom, and PTGui. We recommend Creative Cloud to have the latest versions of Photoshop and Lightroom Classic for improved panorama features. This comprehensive workshop will feature more than 12 hours of shooting (weather dependent) and over 12 hours of post-processing. At a minimum you will need a camera*, lens*, a sturdy tripod, and a remote shutter release (wired or wireless). An intervalometer or Promote Control are a step up. Bring your own laptop with required software. If you have other equipment such as a panning head or nodal slide (which is necessary to eliminate parallax) you will have more compositional options and easier stitching. If multi-row or spherical panos are your endgame then you’ll want to have a multi-row panning head such as the ones from Really Right Stuff or Nodal Ninja. *Equipment is paramount for advanced shooting techniques and you will want to have (or rent) good gear. You should have a camera that performs well at ISO 3200 or higher, a full frame sensor is essential (see list below). The other basic gear you’ll need is a fast and wide lens. f/2.8 or larger aperture is preferred, and 14-16mm range is ideal for long exposures without stars trailing. For multi-row panos at higher resolution we recommend 24mm and 35mm f/1.4 primes. Nikon: D600, D610, D750, D800, D810, D810A, D850, Df, D3s, D4, D4s, or D5. If renting, the D750 is a particularly good value. Canon: 5D Mark III, 5D Mark IV, 5DS, 5DS R, 6D, 6D Mark II, 1D X, or 1D X Mark II. If renting, the 6D & 6D Mark II are a good value. This is by no means an exhaustive list! There are many specialized cameras and lenses not included here. Feel free to contact us if you have any questions. Panoramas get big fast, especially with 24 megapixel and larger cameras. You’ll need plenty of available storage, both in camera and on your computer. Bring an external drive to backup your images on. While out in the field it’s best to take notes about the sequence you shoot, either on paper or on your phone, to refresh your memory when stitching later. Smartphones (Android or iOS) have a number of apps that are useful for planning in the field (tides, moonrise/set, sunrise/set, Milky Way movement, weather, panorama calculations, etc. ), and we will cover some of this as well. It is likely to be cold in early June at night. Bring plenty of layers and warm boots, gloves, hat, etc. We usually have extra handwarmers and rubber bands to put on lenses to prevent dew/frost, but feel free to bring your own as well! Bring extra batteries (camera and remote) to keep warm in your pocket and swap out every now and then. Read this article on Night Sky Photography for more information on shooting the night sky. More information on lodging coming soon! A 43% moon rises to the left behind our campfire while the Milky Way shines to the right at New England Outdoor Center on October 13, 2017, 00:40. I set the camera in the shadow of a large pine tree lit by one of the cabins for this panorama; I liked the sharp patterns of the shadows across the lawn. 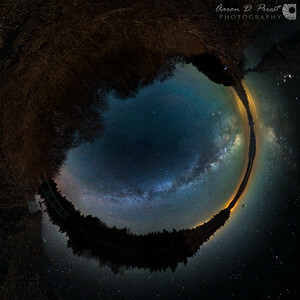 The full 360° panorama can be explored here: https://roundme.com/tour/206481/view/561065/ Camera settings: 14mm, f/2.8, ISO 2500, 20 seconds (single exposures). Stitching data: 2 rows of 6 images for a total of 12 photos. This is a 3:1 crop from a 360 panorama. Equipment used: Nikon D850, Nikon 14-24mm f/2.8, Nodal Ninja RD16-II, and Really Right Stuff TVC-34L tripod, leveling base, & pano/gimbal head. Edited in Lightroom, aligned with PTGui, and blended in Photoshop. Nadir patched with Pano2VR. Taken last night at our three-night panorama workshop with Vincent Lawrence of Acadia Images Photography Workshops and myself on May 19, 2017, 23:35 at Little Hunters Beach in Acadia National Park, Maine. Camera settings: 14mm, f/2.8, ISO 6400, 20 seconds for the sky and f/2.8, ISO 6400, 4 minutes for the ground. Stitching data: 1 row of 3 images x 2 exposures. Equipment used: Nikon D810, Nikon 14-24mm f/2.8, Really Right Stuff TVC-34L tripod & pano/gimbal head, Nodal Ninja RD16-II rotator, and qDslrDashboard. Edited with Lightroom, aligned with PTGui, and blended in Photoshop. Noise reduction via PixelFixer. Planned with PhotoPills. April 30, 2016, 1:40 – 2:33 AM I just got back from a camping/photo trip in the northern Maine woods with my good friend Garrett Evans, shooting the night sky from some new, unique locations. This is the Milky Way reflecting in Round Pond on the Allagash Wilderness Waterway with Mt. Katahdin in the distance. Even to the naked eye the reflection of the stars in the water was amazing! To the left is Chamberlain Bridge, to the right is Garrett shooting along the shore, and near the center is a 48% moon rising. This is a 3:1 crop of a 360° spherical panorama. It took a few days to blend and stitch as it’s really three panoramas blended together: I shot the sky at 17 seconds for sharp stars, the reflection at 30 seconds to make it a little brighter, and one minute exposures of everything else at a lower ISO after the moonrise for more foreground details, as well as separate frames of the moon and Garrett. I merged the exposures separately for each frame in Photoshop first with a combination of Raya Pro and luminosity masks, aligned everything with PTGui (including the two separate exposures of the moon and Garrett), and then blended everything together manually via masks in Photoshop. As a result there were a lot of layers and the .PSB file is about 12GB before flattening. Camera settings: 14mm, f/2.8, ISO 6400, 17 seconds for the sky; ISO 6400, 30 seconds for the water; ISO 3200, 60 seconds after moonrise for shadow details; ISO 1600, 1/125 & 1/30 second for the moon and reflection. Stitching data: 28 images merged into 2 rows of 6 columns and aligned with PTGui Pro. Blended with Photoshop. Equipment used: Nikon D810, Nikon 14-24mm f/2.8, Promote Control, and Really Right Stuff TVC-34L tripod w/ leveling base & multi-row panning head. Edited with Lightroom. Long exposure noise reduction via PixelFixer. Planned with PhotoPills. April 30, 2016, 12:27 – 1:21 AM This is the Round Pond boat launch at the top of the Telos Road on the Allagash Wilderness Waterway in Maine. Chamberlain Bridge is to the left and seven Eta Aquarid meteors are overhead. You can’t see them all in this crop, but they are visible in the full spherical panorama on RoundMe: https://round.me/tour/43860/view/113082/ Camera settings: 14mm, f/2.8, ISO 5000, 17 seconds for the sky & ISO 5000, 120 seconds for the ground. Stitching data: 24 images merged into 2 rows of 6 columns and aligned with PTGui Pro. Blended with Photoshop. Equipment used: Nikon D810, Nikon 14-24mm f/2.8, Promote Control, and Really Right Stuff TVC-34L tripod w/ leveling base & multi-row panning head. Edited with Lightroom. Long exposure noise reduction via PixelFixer. Planned with PhotoPills. 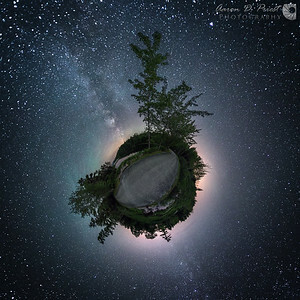 This spherical panorama was taken on one of the carriage roads that goes around Eagle Lake on Mount Desert Island, July 14, 2015, 2:06 AM during a night photography workshop that I co-instructed with Mike Taylor and Vincent Lawrence. I positioned myself in the middle of the road where I would get a good reflection of trees on both sides. While I was setting up this shot a beaver crossed the road, bumped my tripod leg, and made a horrific splash on the other side. I’m not sure who was more startled at the brief encounter! 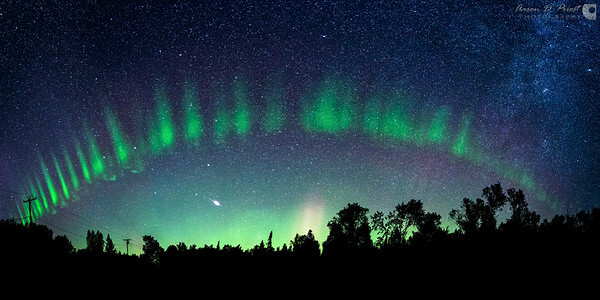 The Milky Way arcs straight overhead at this time of year and hour, with alternating green and purple air glow. The Andromeda galaxy is visible to the north east over the light pollution of Bar Harbor. I shot two spheres of different exposures—one for the sky and one for the ground—and blended them via luminosity masks in Photoshop before stitching with PTGui Pro. The tripod was removed from the nadir afterward in Photoshop. 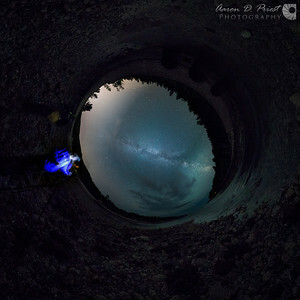 I’ll be teaching how to do all this in an upcoming May workshop in Acadia: http://galleries.aaronpriestphoto.com/Workshops Camera settings: 10.5mm, f/2.8, ISO 5000, 30 seconds for the sky and 120 seconds for the ground. Stitching data: 1 row of 7 photos plus a dedicated zenith for each exposure, as well as a dark frame of each exposure. I wanted a lot of overlap to compensate for the softness of the 10.5mm fisheye around the edges. The finished panorama is 65MP, this image is a 3:1 crop out of the middle. Equipment used: Nikon D810, Nikon 10.5mm f/2.8 fisheye (lens hood shaved off for full frame use), Panoneed robotic head, Promote Control, and Really Right Stuff TVC-34L tripod w/ leveling base. Dark frame subtraction with Pixel Fixer, RAW conversion in Lightroom, exposure blended with Photoshop, stitched with PTGui Pro, and planned with my favorite app PhotoPills.